Everyone is familiar with the image of Boris Karloff's 1931 depiction of Frankenstein's monster, replete with neck-bolt and stitches. But long before Kenneth Brannagh and Robert de Niro, before Peter Cushing and Christopher Lee even before the immortalized image of Boris Karloff as our beloved monster - there was Charles Ogle. Now you shouldn't feel bad if you don't recognize the names of Ogle, Dawley or Fuller. Admittedly you have to be a special kind of obsessed, anally retentive film nut to know these names off hand. But luckily for you, that's where your classic movie master comes in. More than twenty years before director James Whale immortalized Boris Karloff as Frankenstein's monster, J Searle Dawley gave moviegoers their first glimpse at Mary Shelley's popular tale. 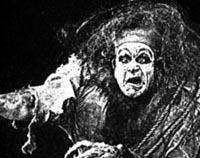 The 1910 version of "Frankenstein", sometimes also referred to as "Edison's Frankenstein", is believed to be the first filmed version of the story. It is also quite often said(erroneously so) that it is the world's first horror movie. This is however simply not the case as that honour goes to Georges Melies' 1896 film "Le Manoir du Diable" better known as "The Haunted Castle". The reason it is called "Edison's Frankenstein" is because it was made by Thomas Edison's Edison Studios, although Edison appears to have had nothing to do with the film himself(he merely owned the production company). 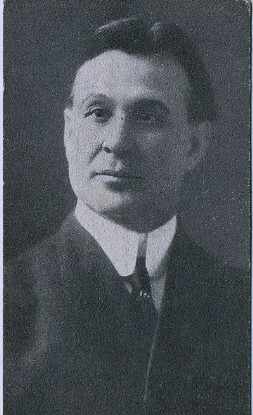 The movie was written and directed by J Searle Dawley, a man who styled himself as the "first motion picture director", although the veracity of this claim can be brought into serious question. Frankenstein was played by Augustus Phillips, Mary Fuller appeared as Elizabeth and Charles Ogle brought the monster to life(as it were). But the fact that we even know about the film or that I am able to write about it at all(or that you can watch the movie on this site for free, you're welcome) is perhaps the most remarkable side to this story, as the film was forgotten and considered to be lost forever for over half a century. to be profitable. After they had finished their run the reels were recalled to be stripped down to recover their valuable silver content. This is the largest reason why today we only have a fraction of the nearly 1200 films that were produced by Edison Studios during it's existence. "In making the film, the Edison Company has carefully tried to eliminate all the actually repulsive situations and to concentrate its endeavors upon the mystic and psychological problems that are to be found in this weird tale... we have carefully omitted anything which might by any possibility shock any portion of an audience.". Critically speaking "Frankenstein" was relatively well received. The New York Dramatic Mirror said : "This deeply impressive story makes a powerful film subject, and the Edison Players have handled it with effective expression and skill" in a review published on 26 March 1910. Audiences on the other hand were more divided. The creation scene especially drew condemnation and was considered to be sacrilegious. It was also a little controversial as the debate over evolution was stil fairly hotly contested at the time. As a result the movie was withdrawn from circulation and soon forgotten by all. And Forgotten it remained, for over fifty years it was as though it never even existed. That was until 1963 when film historian Edward Connor discovered a copy of the Edison Kinetogram(an in house publication advertising the films to be released during a specific week) published on March 15 1910. On the cover was a photo of Carles Ogle in full Frankenstein makeup with the caption "Scene form Frankenstein, Film No 6604". The discovery was a revelation and it sparked a frenzy worldwide amongst film historians and collectors alike. The idea that there was a movie Frankenstein before Boris Karloff in 1931 that we were unaware of was a source of amazement and fascination to all involved. A global search was launched to find a copy of this, until then, unknown film. A second copy of the Kinetogram was then located in London and this copy contained full cast credits as well as a plot synopses. Still the film itself eluded discovery. series of home video compilations of silent era films. No attribution was given to the source of these images. It was later revealed that these were derived from the only remaining copy of the movie. In 1980 the American Film Institute(AFI) released it's list of "The Ten Most Culturally and Historically Significant Lost Films". 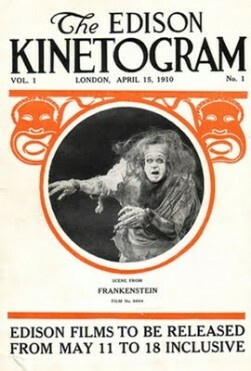 "Frankenstein"(1910) was included on the list. 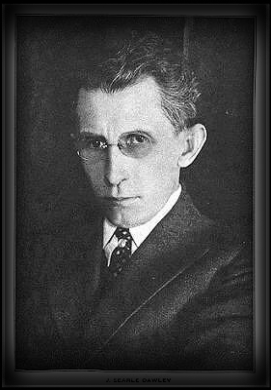 This prompted a Milwaukee collector, one Alois F. Detlaff, to contact the AFI and reveal that he had what is believed to be the last remaining copy of the film as part of his collection. guarded the film, knowing that it was the only one of it's kind in existence. Realizing the significance of the movie he refused to share his toys with the rest of the world, and instead demanded exorbitant amounts of money for the original film. The images released in the '70's it seems came from Detlaff himself but he was never compensated, either by attribution or monetarily. This perceived slight led to paranoia about him losing control over what he saw as his property. In 1986 he donated a "copyright protected" version of the movie to the Academy of Motion Arts and Sciences. This was actually a filmed video of the original projected film with a copyright notice that scrolled across the center of the screen. This ludicrous measure however rendered the movie unwatchable, and it is widely condemned as such. Detlaff consented to have the film screened at a handful of film festivals during the 1990's the first being at the Avalon Theater in his home town on October 30, 1993. This marked the first time in over 80 years that the film was seen by the general public. Another decade would pass before Detlaff finally released the movie on DVD, in 2003, and it became available to be purchased by anyone interested to do so. Detlaff passed away only two years afterwards in 2005. Writer Frederick C Wiebel Jr chronicled the fascinating story of this movie in his book "Edison's Frankenstein", from i'ts inception to eventual re-emergence. It comes well recommended to anyone interested in the finer details of this piece cinematic history. As mentioned prior "Frankenstein" is a one-reeler, with a total running time of around 14 minutes. 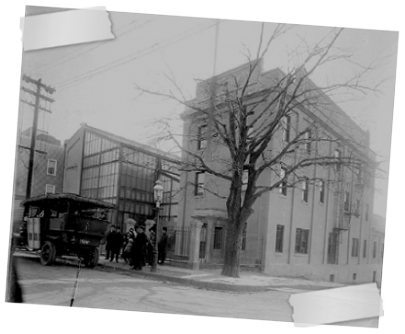 The movie was filmed at the Edison Studios in the Bronx, New York City over three days somewhere between January 13 to 19, for a total budget of $500. 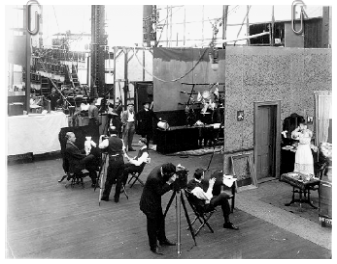 After completion the film received approval from the Orange County office on February 1 st . Musical accompaniment and tinting of selected frames was then finished and the movie premiered on Friday 18 March 1910. 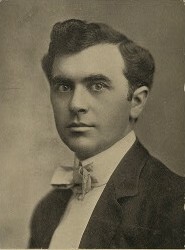 Augustus Phillips, who plays Frankenstein, was an accomplished and respected Broadway performer by the time he became a member of the Edison stock performers. This tradition of Edwardian theater is clearly evident in his performance with broad sweeping gestures and posing in grand exaggerated fashion. The rest of the cast put up for display a far more convincing and naturalistic performance. This is especially true of Mary Fuller who played the part of Frankenstein's fiancée Elizabeth. Her performance stands out in this production despite the fact that she hardly has any screen time at all. 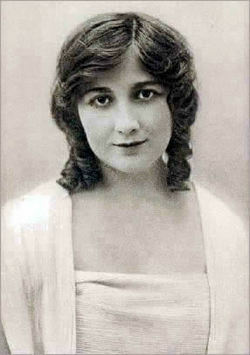 She also has the distinction of being one of the first ever actresses to receive a on-screen credit, this for the 1911 production of "Aida". As the monster Charles Ogle was responsible for his own makeup and costume design, a common practice at the time. The result is a misshapen, snarling, hunchbacked creature with elongated fingers and wild unkept hair. awry and a grotesque monstrous creature is brought forth instead. Frankenstein is thusly undone by his own hubris. 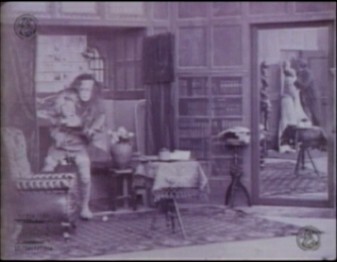 The title card reads : "Instead of a perfect human being, the evil in Frankenstein's mind creates a monster". The not-so-subtle sub text about the "dangers" of science unchecked running amuck in society, the blasphemy of intruding into God's domain, hardly needs further speculation here. The central point of the movie has to be the creation scene, where Frankenstein creates his creature. 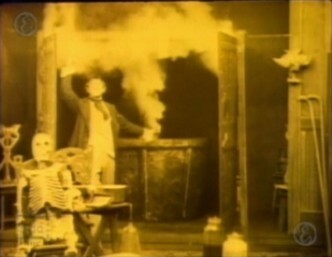 Admittedly an impressive bit of special effects for 1910 that manages to hold up surprisingly well to this day. 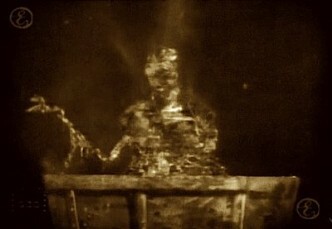 Unlike in later versions where the creature is constructed from dismembered body parts, here Frankenstein literally creates his monster from a cauldron-like vat containing a seemingly unholy mixture of chemicals. We watch as the monster assembles itself before our very eyes around a skeletal frame, and so the creature is ushered into being. 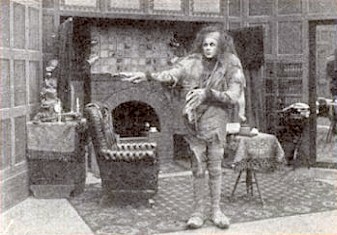 This effect was achieved by first constructing a dummy that resembled Ogle's monster. Then setting the dummy alite and allowing it to burn until it collapsed into a smoldering heap, then simply playing the footage backwards. Repulsed by what he had done Frankenstein abandons his pursuits and returns home to the comforting arms of his beloved fiancée, Elizabeth. The monster naturally follows his father home with all the devotion of a lapdog but only succeeds in haunting his creator who wants nothing to do with the abomination he brought into being. Envious over the affection that Frankenstein showers over Elizabeth the monster rebels. Creature and creator fight but Frankenstein is no match for the monster's brute strength. Then the monster spots his own reflection for the first time, he is so shocked by the image that he flees into the night. This scene can also be interpreted as Frankenstein struggling with his own conscience and inner demons. On this point I must mention the use of mirrors in these scenes where the two meet. It is put to dramatic cinematic use to brilliantly and more clearly emphasize the central theme of the movie, as will be seen momentarily. We then jump ahead to Frankenstein's wedding night. After the wedding guests have left, the bride and bridegroom are alone at last but then suddenly the monster re-appears. Breaking into the house, he pursues Elizabeth into the bedroom while Frankenstein is off doing heaven knows what in the drawing room. Poor Elizabeth literally sees a monster on her wedding night(read into that what you will). She promptly faints and Frankenstein re-enters the scene to discover the monster hovering over his unconscious bride. Here Dawley gives us something truly delicious to mull over. 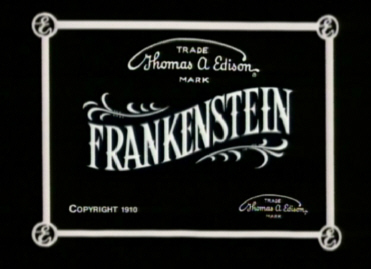 The inter title reads : "The Creation of an Evil Mind is Overcome by Love and Disappears"(echoing the earlier "the Evil in Frankenstein's Mind Creates a Monster"). The monster retreats into the drawing room, seemingly conflicted over his actions, he gazes fully unto his own reflection in the mirror, and then vanishes leaving only the reflection behind. 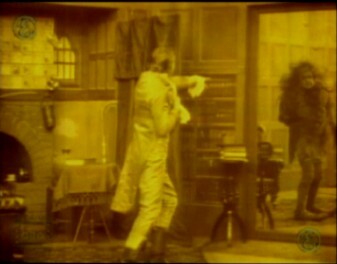 Upon this Frankenstein enters the room and sees the mirror. For a moment Frankenstein sees the monster reflected back at him in the mirror, slowly the reflection of the monster fades and only Frankenstein remains. Elizabeth and Frankenstein embrace in triumph. The end. In this Frankenstein's internal conflict is externalized in the rivalry between Elizabeth and the monster. The duality of mankind is depicted brilliantly in this last scene where good is seen to triumph over evil in the battle for a man's soul. Ultimately the very existence of the monster is brought into question. Did he really create this hideous creature or was it merely a Stevenson-esque Dr. Jekyll/Mr. Hyde manifestation of his own personality? This question is left ambiguous. Inspite of the very stiff fixed camera position and the almost stage like, albeit lavish, set design, what J Searle Dawley manages to produce for us is a delight to watch. The movie may have taken nearly a century to become known and fully appreciated by cinephiles, but I dare say the wait was worthwhile. Your classic movie master recommends Frankenstein(1910) with 3 ½ pills on the madness meter, plus it is less than 15 minutes long so really what are you waiting for - watch it now.